Most of us associate dehydration with hot summer months, sweaty bodies, and lots and lots of sun and heat. But that’s not necessarily the case. 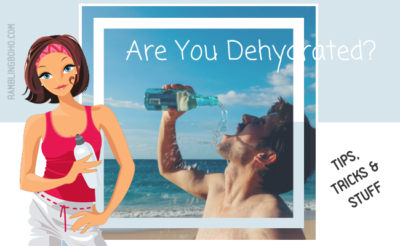 Dehydration is a very common problem, and you might not even know you are dehydrated! Severe dehydration is when you start to feel lightheaded, you might be nauseous or even vomit, and your pee is dark. But what about mild dehydration, or chronic dehydration? Mild/chronic dehydration won’t throw your body into shock, but it can leave you feeling irritable, tired, achy, and just plain under the weather. What exactly is dehydration? Simply put, it’s loss of water from the body from fluid deprivation. But, I’m not thirsty, how can I be dehydrated? You can be dehydrated and not even know you were even thirsty. Women over the age of 30 start to lose the ability to register thirst. 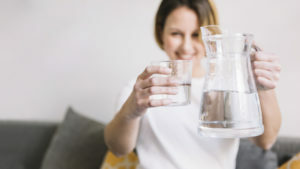 Many women can end up being dehydrated for years and because of that, start to gain weight and develop chronic fatigue. Do you drink lots of coffee, tea, or diet soda? Yes, the main ‘ingredient’ in these drinks is water. However, caffeine is a diuretic. A diuretic is a chemical that increases flow of urine from the body. Many women use diuretics during their menstrual cycle to help with the water weight, or bloat. 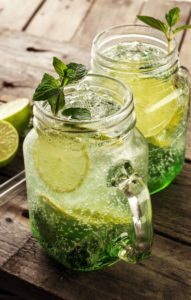 However, if you are constantly intaking a diuretic into your body, you are expelling the body’s much needed water from these beverages, which leaves you dehydrated. But that’s not all. The aspartame in your diet drinks works like a magnet on water molecules, drawing fluid from body cells. Thus leaving you…you guessed it, dehydrated. Other factors that can leave you dehydrated besides age, sweeteners & diuretics, are chronic stress and low intake of omega-3 fatty acids. Without this ‘brain food’, the sensors in your brain that let you know you are thirsty are impaired. Also add to this list, is constant dosing of anti-histamines such as Claritin, Allegra, and Zyrtec. These medications suppress the actions of histamines, which is great for those suffering from allergies. However, histamines are also a safeguard against dehydration. If your water intake drops, histamine levels rise to slow fluid loss from the body. This is a good thing. So if you are constantly taking anti-histamines, your body cannot fight against dehydration. OK, so what are the symptoms of dehydration? Well, from a medical standpoint, if you are frequently urinating, and it is not pale or almost clear, you might be dehydrated. Some of the most common symptoms seen of chronic dehydration are weight gain, brain fog, exhaustion, forgetfulness, stress, aches, tiredness, depression, and anxiety. Wow, so I may be dehydrated. What can I do? Well, this is an easy one. I mean, if you are really worried about it, you can visit the doctor and get some blood work done to test for dehydration. However, you don’t need to jump to extremes yet. Just increase your intake of water. But be careful, and don’t go overboard. You can become water intoxicated….and that’s bad. What happens, is when you get too much water in your system, you dilute the sodium your body needs, and that is called hyponatremia. But it’s not only how much you drink, but how fast you drink it. Sip your water throughout the day, don’t gorge yourself all in one shot. And if you are exercising, make sure some of your water beverages include much needed electrolytes. This will help prevent hyponatremia. But how much water do I need? A healthy adult kidney can process fifteen liters of water a day, over the course of the day. Your body needs a total of about three quarts of water per day to stay hydrated. Some of this water you get from fruits and veggies. It is a good idea to eat lots of watery fruits and veggies if you are trying to discern if you are dehydrated. Lettuce and watermelon contain 90% water. One doctor suggests dividing your weight (in pounds) by 2. This is the water, in ounces, your body needs throughout the day. (Ie: a 160lb woman would need 80oz of water a day). This concurs with the 8-12, 8oz glasses we often hear is the recommended amount. If you are outside, sweating, or exercising, you need to up that by one glass per hour of exertion. Just remember…throughout the day….sip your water! So, if you feel tired, achy, or cranky….you might just be dehydrated. Take a closer look at your water intake. Try to lay off the caffeine, diet beverages, and anti-histamines for a couple weeks, and adding more fruits & veggies and water to your daily diet. If you are dehydrated, you should see immediate results.